Gamma camera is used for the functional imaging of different organs. For the proper performance, it is mandatory to perform the routine quality control test of equipment as per manufacturer's recommendations and standard guidelines. Apart from routine quality control test, the understanding of operating principles of the system is also required to ensure the images with the best quality. 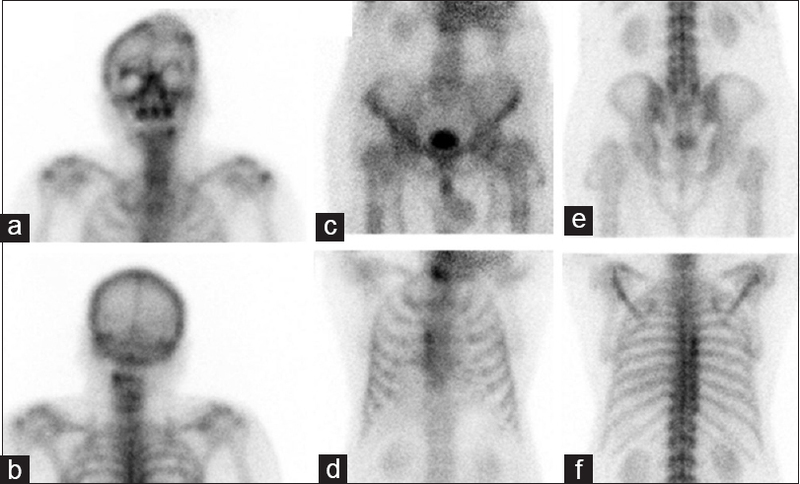 Artifacts which appear in gamma camera images are mainly caused by radioactive contamination, patient motion during imaging, metallic implant in body, selection of inappropriate scan parameters, damaged collimator, cracked crystals, malfunctioning of the photomultiplier tube (PMT), and improper calibration of system. Sometimes, due to spontaneous malfunctioning of gamma camera, these artifacts appear randomly in between acquisition of images. These artifacts not only degrade the image quality but also sometimes provide false-positive scan results. All these artifacts can be routinely corrected after proper identification. In this case report, we discussed the artifact appeared due to spontaneous malfunction of PMTs during acquisition of a bone scan in a patient with carcinoma lung. 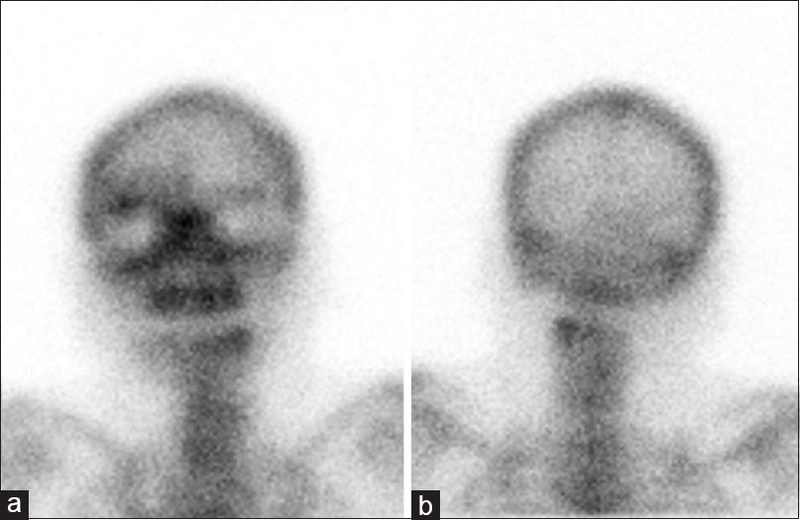 A 57-year-old male patient with lung carcinoma was referred for 99m Tc MDP skeletal scintigraphy for detection of skeletal metastases. Three hour after injection of radiotracer, the whole-body bone scan was performed which revealed a photopenic defect in vertex of skull in anterior projection [Figure 1]a. In view of history of lung malignancy, it was initially diagnosed as lytic lesion representing skeletal metastases. However, on careful evaluation of whole-body image in posterior projection, no such defect was noted [Figure 1]b. On further evaluation, we observed increased tracer uptake in the edge of static chest and pelvis images in anterior projections [Figure 1]c and [Figure 1]d. However, again spot views of same regions in posterior projections were within normal limits [Figure 1]e and [Figure 1]f. These discrepancies caught our attention, and we suspected these to be artifactual. Suspecting nonuniformity, we moved the patient toward the central field of view of the detector to eliminate the artifact from images and noticed no such defect in the skull [Figure 2]a and [Figure 2]b. We immediately performed the intrinsic uniformity test with 99m Tc point source for the anterior detector, which showed the increased value with a similar pattern of artifact as appeared in patient images toward useful field of view (UFOV) [Figure 3]a. Surprisingly, the artifact did not appear in the daily quality control test performed in the morning. We informed the service engineer about the incident. The engineer found malfunctioning of two PMTs toward Y axis in the anterior head of the gamma camera. On the next day, service engineer opened anterior head of gamma camera and replaced the malfunctioning PMTs located in the border. After the service engineers rebuilt the head, tuning was performed to ensure that PMTs voltage gain was within limits. After completion of tuning, intrinsic uniformity test was performed to ensure all the values are within accepted limits [Figure 3]b. After correcting the mistake, another skeletal scintigraphy was performed which was within normal limit and show no such defects in the edge of spot views at anterior projections [Figure 4]. Gamma camera is a complex device with multiple spheres. Because of this reason, quality control of the gamma camera in the regular period along with technical alertness is highly recommended to ensure the proper functioning of the instrument. Uniformity is an important parameter of the gamma camera that defines the variability of counts and distribution of activity in the image. Usually, nonuniformity in the image is reported as a hot or cold spot. The most sensitive part of a gamma camera is PMT, which can produce various kind of artifacts if not properly checked or calibrated. Edge packing is a kind of nonuniformity artifact, which usually appears as an accumulation of counts at the edge of the field of view compared to the central region. The common causes of edge packing artifact in the image are defective collimator, noncalibrated PMTs, and improper adjustment of deflector plates of CRT. The photons interacting from very edges of crystal toward PMTs are not distributed uniformly across the PMTs but are pulled toward the center from the dead space of tubes, forming the edge packing artifact. The edge packing artifact described in our case report seems to be originated due to faulty PMTs. However, our clinical and technical alertness helped us to identify the artifact from images, which was very rare and could have been easily missed or misinterpreted during reporting. The severity of artifact depends on the number of malfunctioning PMTs. Although edge packing artifact and its appearance have broadly described in the literatures, we put forward the same artifact with unique cause and characteristics appeared during routine clinical work, which has not been reported much in clinical studies. Edge packing artifact can occur due to malfunctioning of border PMTs which may mimic pathological lesion in the whole-body bone scan. Careful evaluation and proper technical knowledge of gamma camera help in identification of this error and correcting it accordingly. Lyra Georgosopoulou M, Tindale W, Klett R. Routine quality control recommendations for nuclear medicine instrumentation. Eur J Nucl Med Mol Imaging 2010;37:662-71. Gentili A, Miron SD, Adler LP. Review of some common artifacts in nuclear medicine. Clin Nucl Med 1994;19:138-43. Jackson DE, Petterson CE. Instrumentation. In: Volger JB, Helms CA, Callen PW, editors. Normal variants and Pitfalls in Imaging. Philadelphia, PA: Saunders; 1986. O'Connor MK. Instrument- and computer -related problems and artifacts in nuclear medicine. Semin Nucl Med 1996;26:256-77. Daniel GB. 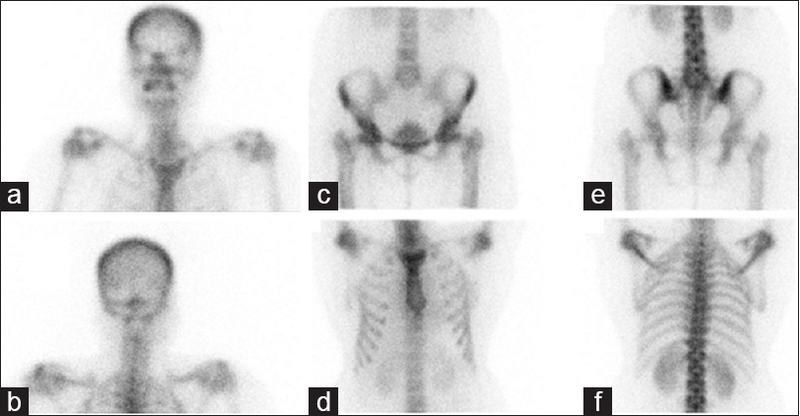 Nuclear medicine artifacts and image quality. Semin Vet Med Surg (Small Anim) 1991;6:119-30. Simon R, Sorenson JA, Phelps ME. Physics in Nuclear Medicine 2012;14:217.